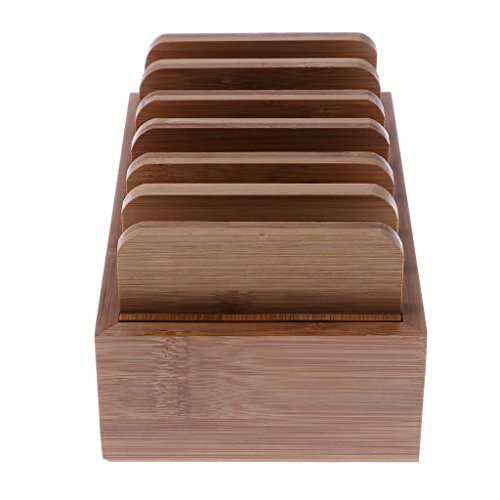 The 100% Eco-friendly natural bamboo dock station stand can hold up to six devices simultaneous maintaining your devices in order and helps to clean up the stacking device. The stand bracket part can be easily installed and removed from the base compartment. Wide and large base compartment allows you to hide all cables, power strips or USB hubs, and keep them neatly and space saving. This dock station is larger than the others, and is simple and practical with great storage and organizing capabilities. It is ideal for corporate meeting rooms, classrooms, restaurants, hotels and living room with multiple technical devices and to keep all neat anywhere. The station is made of 100% natural, durable Bamboo. This product guarantees long-term use. Every edge is polished and smooth, and the streamlined design and structure make the station an attractive decoration and artwork.